The state aims to turn an old problem into an asset. 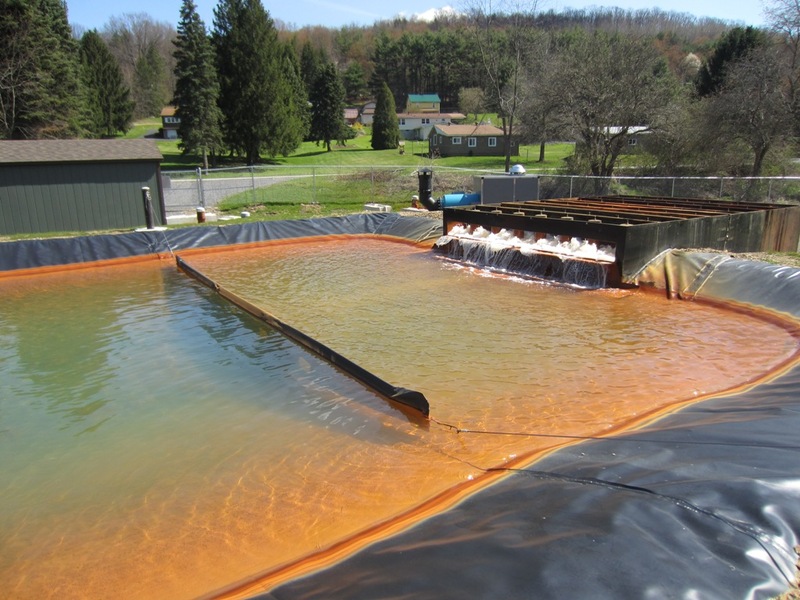 Winner Water Services, a Battelle subsidiary, runs a treatment facility in Sykesville, Pennsylvania that removes iron from the water that flows through an abandoned coal mine. The company would like to sell the water to energy companies for use in hydraulic fracturing. Click to see an enlarged image. Pennsylvania officials hope that an undesirable legacy from its coal mining history will help the state skirt some of the pitfalls of its latest energy bonanza. Pennsylvania’s Department of Environmental Protection is encouraging the use of contaminated water flowing from hundreds of abandoned coal mines for hydraulic fracturing, or fracking, the production technique that has turned the state into a natural gas champion. In January, the department released a white paper that outlines how acid mine drainage (AMD), as the metal- and salt-laden water is commonly known, can be treated and then developed as a source of fracking water. By doing so, the state hopes for a double benefit: cutting the flow of contaminated water from mines into rivers while decreasing the amount of freshwater used in fracking. Pennsylvania wants to see its AMD problem cleaned up, Kevin Sunday, a DEP spokesman, told Circle of Blue. More than 1.1 million cubic meters (300 million gallons) of contaminated water flow from the state’s abandoned mines every day, he said, polluting roughly 5,500 streams. Since the white paper was released, the DEP has seen an increase in the number of proposals to use AMD water for fracking, Sunday said, though he was not able to give an exact count. “We’re still early in the process – a pilot phase – but we believe it will be successful,” he said. Long a top energy-producing state because of coal and oil, Pennsylvania is now riding the natural gas wave. A combination of directional drilling, which keeps a well within the gas-bearing shale layer, and fracking, which blasts a mixture of water, sand, and chemicals to crack the rock and free the gas, has turned the state’s Marcellus shale formation into an energy jackpot. Since 2008, the state’s gas production has increased more than ten-fold, moving it from 14th to sixth in the nation. The same shale revolution has swept the nation, turning the United States into the world’s leading gas producer. At the same time, the coronation of shale gas has been marred by widespread concern about the potential harm to the environment and human health, both from the techniques used to produce it and the very fact of burning it as a fuel. Scientists and environmental advocates have raised questions about the supposed climate benefits of natural gas, which burns cleaner than coal but also leaks heat-trapping methane, and about the air quality for people living near wells. But the loudest clamors have come against fracking. Opponents cite the quantity of water used to frack a well and the risk of water contamination – both from the fracking process itself and from handling the wastewater. A study from Duke University also published last month found traces of methane in groundwater in northeastern Pennsylvania, most likely because of poorly constructed gas wells. But a similar investigation in Arkansas from the Duke team and the U.S. Geological Survey found no evidence that fracking chemicals or methane contaminated groundwater. By tapping its mines, Pennsylvania hopes to reduce the amount of freshwater – some 19,000 cubic meters (5 million gallons) per well on average – used to exploit its gas reserves. For years AMD water has been promoted as an alternative source for fracking in Pennsylvania. The Marcellus Shale Advisory Committee, convened by Governor Tom Corbett in 2011, recommended that the state develop laws to nudge gas drillers in that direction. A year earlier in a paper published in the journal Environmental Science and Technology, a group of U.S. Environmental Protection Agency scientists suggested that AMD could resolve Pennsylvania’s water quality and quantity problems. For various reasons, other states with a mining heritage have not followed suit. Thom Kerr, the permitting manager for the Colorado Oil and Gas Conservation Commission, told Circle of Blue that he is not aware of any AMD water being used for fracking. The mine sites are too far from the wells, he said. Pennsylvania does not have a water quality standard for AMD water used in fracking operations, Sunday, the DEP spokesman, said. Most of the injected water remains underground; in the Marcellus roughly 10 percent returns to the surface. Pennsylvania requires this water – a mixture of fracking water called “flowback,” and natural sources called “produced water” – to be recycled or treated before being discharged to rivers. However, a study published in March in the Proceedings of the National Academy of Sciences showed that treatment plants do not remove all of the contaminants, chloride in particular, from fracking wastewater. Even after earning a state permit, an AMD project may have to win endorsements from river basin commissions. That is the case for Winner Water Services, a company that is treating contaminated water from a mine near Sykesville, in western Pennsylvania. The Battelle subsidiary wants to transfer some 3,785 cubic meters (1 million gallons) of water per day from a facility in the Ohio River Basin. Tanker trucks would carry the water to fracking sites in the Susquehanna River Basin. The company made its first sale last year but has signed no deals yet this year, though at least three drilling companies have expressed interest, John Ontiveros told Circle of Blue. The state has given Winner a permit to use the water in the Ohio River Basin, but the company is applying to the agency that manages the Susquehanna River to use the water in that basin. The Susquehanna River Basin Commission (SRBC) approved the state’s first AMD-for-fracking project in 2010. It will rule on Winner’s proposal in September, after a public hearing next month in Harrisburg. Andrew Dehoff, the commission’s manager of project reviews, told Circle of Blue that the SRBC will verify that the treated mine water would not be detrimental to the basin’s hydrology, either through water contamination or by spreading invasive species. The water at Winner’s Sykesville site is relatively clean. The company runs it through an oxidizer and settling pond to remove most of the residual iron. Winner hopes a market develops for the treated water, which today is put back into a local creek. Once the commission approves a water source for use within the basin, an energy company would have to include it in the company’s water management plan, which is submitted to state regulators. For now, Pennsylvania is a test bed for AMD. Regulators at the DEP are working on favorable policies. Some lawmakers are trying to pass a bill that would limit the long-term liability for companies using AMD water for fracking. And the National Energy Technology Laboratory is working with the University of Pittsburgh to develop better treatment processes. If its disposal is a problem now, why does fracking suddenly make it OK to leave trillions of gallons of it in the ground? There is way t ake fracking safe – or indeed any extraction of fossil fuels. STOP it, before it stops us.